Kingston-on-Murray is a small township (population around 300) located 214 km north-east of Adelaide on the mighty Murray River. It lies in the heart of a rich agricultural district and the area around the town is characterised by vineyards and orchards. The town is important as one of the major Murray River crossing points and it was common for cars and trucks to be waiting for the ferry on both sides of the river. This changed when a new bridge was constructed taking the Sturt Highway around the edge of the town. The sizeable Kingston Estate Winery marks the turnoff to Kingston-on-Murray. The town's shady riverbank is perfect for picnics with free barbecues, chairs, tables and toilets, and a nearby general store for provisions. Originally called Kingston, the town was part of the new village settlement scheme started in the 1890s. 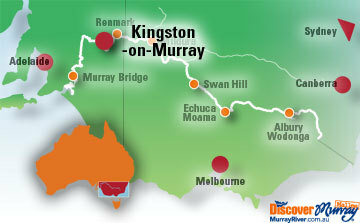 The tag "on-Murray" was added to distinguish it from the town Kingston in the state's South East. The town was named after Charles Cameron Kingston who was Premier of South Australia from 1893-1899. He was a hugely important figure in state and federal politics, being involved in the drafting of the first Federal constitution and becoming a minister in one of the early federal governments. Banrock Station is an impressive project by one of Australia's big wine companies, Hardys, to balance agricultural use and nature conservation. There's an eight-kilometre boardwalk trail through the wetlands and an impressive interpretive and wine-tasting centre that also serves light meals. 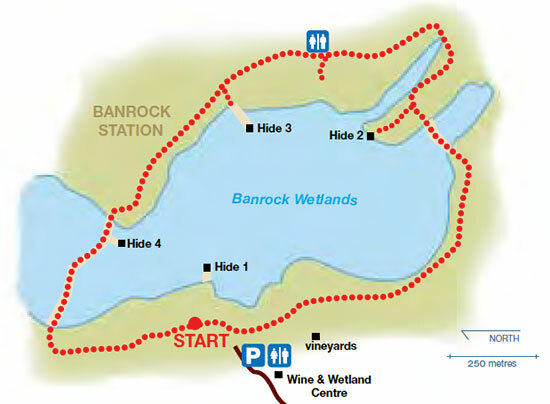 In November 2002, Ramsar listed the Banrock Station Wetland complex as a Wetland of International Importance. The walk features story centres, information huts and bird hides to observe the many species of birds living in the wetland including ducks, Black Swans, Australian Pelicans, Rainbow Bee-eaters, Ibis, spoonbills, herons and egrets. One of Australia's great explorers, Captain Charles Sturt, landed near the town on his Murray River expedition of 1830. The lookout that marks the spot also affords good scenic views. The MV Loch Luna Eco-Cruises depart from the riverbank daily by appointment. Take a tour to the Lake of the Moon and soak up the beautiful views of the river's backwaters. The town and surrounds have a range of accommodation, including a fleet of modern houseboats, a backpacker hostel, bed & breakfast and the Kingston-on-Murray Caravan Park. The Moorook Game Reserve is signposted beside the Kingston-Loxton road 4 km south of the Sturt Highway. It is a pleasant and peaceful game reserve with sedges and reeds growing along the edge of Wachtel's Lagoon. Located 7km north west of Kingston-on-Murray this reserve is a mixture of cliffs, river flat and scrubland which is notable for a number of well preserved Aboriginal canoe trees, a midden and a limestone cave which was used by Aborigines for thousands of years.